Ilham Tohti is a Uyghur economist, writer, and professor. He is currently serving a life sentence for “separatism” because his work promoted ethnic harmony and understanding. 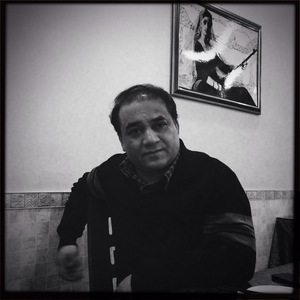 Ilham Tohti is one of the best-known scholars on Uyghur issues who co-founded the website Uyghur Online, which was designed to promote understanding between Uyghurs and Han Chinese. It is now blocked inside China. Since on website’s founding in 2006, Tohti has been a target of frequent harassment by Chinese authorities for his outspoken views on Uyghur rights. Tohti, a member of the Uyghur PEN Center, was born in Artush, Xinjiang Uyghur Autonomous Region (XUAR) and has two young sons and an adult daughter, Jewher Ilham, who currently lives in exile in the United States. Ilham Tohti was the winner of the 2014 PEN/Barbara Goldsmith Freedom to Write Award. You can read Jewher Ilham’s acceptance remarks here. November 2017: Tohti is awarded Liberal International’s Prize for Freedom, which is given once each year to a person whom it says has worked to improve human rights and political freedoms. October 2016: Tohti is awarded the Martin Ennals Award for Human Rights Defenders. The award is given to “Human Rights Defenders who have shown deep commitment and face great personal risk. September 2014: Tohti’s trial is held from September 17-18, with the prosecution presenting evidence that includes testimony made under duress from Tohti’s students. Tohti is only allowed to speak on his own behalf on day two of the trial. According to Attorney Liu Xiaoyuan, “whenever Ilham entered the court, he was able to smile and greet the personnel in the court in Uyghur. In the inquiry and argument stage, Ilham also wore a smile. Sometimes when he spoke there was a torrent of words, his voice ringing loud and clear; with his hands he gesticulated too. The presiding judge reminded him: this is a court of law, not your classroom. He remained indignant at the false accusations.” Tohti is convicted on charges of “separatism” and sentenced to life in prison on September 23, 2014. June 2014: Tohti is finally granted permission to see his lawyer, Li Fangping, on June 26, 2014. Li reports that Tohti was shackled for 20 days at the start of his detention and was denied halal food for 10 days from March 1 to March 10, in violation of international law barring acts of cruel, inhuman, or degrading treatment or punishment. February 2014: Tohti is formally arrested and charged with “separatism”; a public statement by the Bureau of Public Security for Urumqi alleges that Tohti has recruited followers through Uyghur Online. Following his arrest, several of his students are allegedly strip-searched, questioned, and detained. Three of these students are formally charged, while the whereabouts of a further two remain unknown. Tohti’s case is handed to the Urumqi City Procuratorate, which is in charge of the decision to indict. January 2014: The Communist Party of China launches a “grand strategic plan” for the Xinjiang Autonomous Region on December 19, 2013. Tohti publicly expresses his fears concerning the increased pressure on Uyghurs. Shortly afterward, on January 15, 2014, police raid Tohti’s Beijing apartment and detain Tohti. His mother is also missing for several hours and may have been taken into custody. Tohti’s wife, Guzaili Nu’er, arrives home from work to find the officers rampaging their home, removing several computers, flash drives, books, papers, and his students’ assignments. The officers force their sons, aged 4 and 7, to remain on the couch and threaten them when they tried to stand. The next day, a Chinese Foreign Affairs Ministry spokesman states that Tohti has been “criminally detained” on suspicion of “committing crimes and violating the law.” Tohti begins a 10-day hunger strike on January 16 to protest being denied halal food. He loses a considerable amount of weight, and concerns for his well-being. November 2013: Security agents allegedly ram Tohti’s car, and warn him against speaking to foreign media, threatening his family. Tohti has been giving interviews with increasing regularity after a car crashed into Tiananmen Square on October 28 and was set on fire; the family inside was Uyghur. The Chinese government label the incidence as an act of terrorism. February 2013: Authorities detain Tohti at the airport and prevent him from traveling to the United States in order to take up a post as a visiting scholar at Indiana University. His daughter, who is detained with him, is released and put on a plane to Indiana by herself. April 2010: In a continuation of a pattern of harassment, Chinese authorities warn Tohti against leaving for an international conference on Turkic culture at Ege University in Izmir, Turkey. July 2009: Tohti is detained after speaking out about the ethnic unrest that broke out in Urumqi, the capital of XUAR, on July 5, 2009. He is initially held under house arrest before being transferred to an unknown location where he is held incommunicado for interrogation. He is released on August 22, 2009. 2006: Tohti establishes Uyghur Online in 2006, and has been a target of frequent harassment by Chinese authorities since then. China: What’s in a Law?